Air Conditioning Repair Hillsborough County: How Important is HVAC Maintenance? 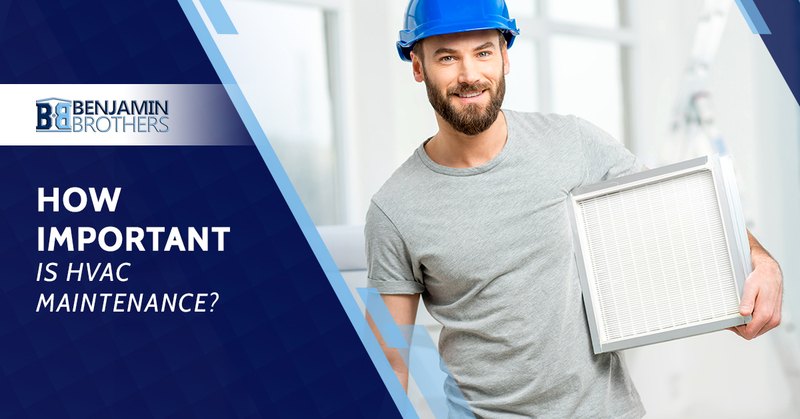 How Important is HVAC Maintenance? At Benjamin Brothers, we’re proudly serving the folks of Hillsborough County and helping them with all of their air conditioning needs. Even in the “winter months,” any Florida resident can tell you that hot days can appear almost out of nowhere, and when we see this warmer weather, many of us are turning on our AC units. If you’ve ever had AC problems, you understand how frustrating it can be to suffer in the heat without the solace of a nice, cool home. The next time you encounter issues with your air conditioning here in Hillsborough County, give our experts a call or visit our website to schedule service! When you were a kid, teenager, or even a young renter, you never had the same set of worries that plague you now as a homeowner. You’re forced to pay attention to the condition of your roof, yard, heating and cooling systems, and so much more. Because it’s vital to the care and longevity of your home, you try and fix things when they’re broken. But have you ever considered getting things checked out before they break? Preventative maintenance is one of the best ways to save money, time, and frustrations in the long run. In our blog today, we’re going to discuss the importance of regular maintenance when it comes to your air conditioning unit. Continue reading below to learn more! Many people don’t realize that having regular maintenance performed on their AC unit or furnace can actually save them money. Since routine inspections and service calls are usually the method by which issues with your unit are discovered, it’s important to keep that maintenance regular. If no one is ever inspecting your HVAC unit, small problems will turn into large problems and you’ll spend so much more money than you would have. In addition to avoiding costly repairs, keeping up with your unit’s normal maintenance means that your energy bills might be significantly lower. When you haven’t touched your HVAC units in years, and you’ve never called a Hillsborough County air conditioning repair professional, chances are that you’ve been breathing in air that is filled with dust, allergens, and even bacteria. When your AC and furnace filters get dirty, they stop ridding the air of these toxins. Too many particles in your air could lead to allergies, respiratory illnesses, and even asthma. Make sure that you’re contacting your AC repair pro to avoid changes in your air quality. When your air conditioning unit isn’t functioning properly, the temperature of your home is often affected and if anything can change the way that your unit functions, it’s the lack of regular maintenance. Getting routine inspections performed on your AC unit and furnace will ensure that your home remains a comfortable temperature at all times. When regular maintenance isn’t performed on your AC unit, you’re putting yourself and your family in danger. As we mentioned above, poor air quality can lead to some pretty concerning health issues. Additionally, when your air conditioning unit needs repairs, you could be allowing for a fire hazard or even a carbon monoxide leak. Make sure that your home is always as safe as possible by scheduling regular service of your HVAC units. Perhaps you could consider this point a combination of all of the above reasons for HVAC maintenance. When you know that your large appliances are functioning properly, you can know that you’ve done everything that you can to ensure that your home is safe, functional, and efficient. There is truly no replacement for that kind of peace of mind. When you haven’t gotten your air conditioning unit inspected regularly, you’re putting your home and unit at risk. It’s recommended that you seek an HVAC inspection at least once per year so that you can rule out any large concerns that might be plaguing your system. This maintenance could save you time, money, and unnecessary frustration. If you’re needing air conditioning repair in Hillsborough County, there is no better team of experts to call than Benjamin Brothers. Contact us for your AC repair and replacement needs!